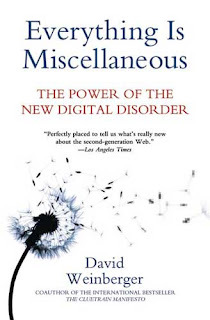 Everything is Miscellaneous: The Power of the New Digital Disorder by David Weinberger (2007) was on my Christmas list last year, perhaps because I am a giant library science nerd. It set the library-blogosphere on fire when it was first released, and responses seemed to be either vehemently supportive or completely dismissive. 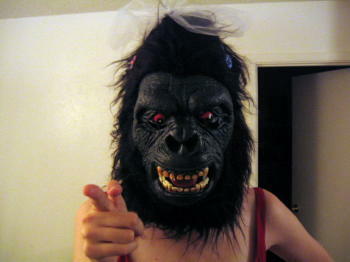 When it also came highly recommended by both the Boing Boing and LibraryThing folks, I knew I had to give it a shot. And although it occasionally riled up my librarian sensibilities (only in the most nitpicky of ways), I ultimately really enjoyed this book. Weinberger proposes that the possibilities for ordering information in the digital and networked world can completely change the way we approach knowledge and learning. To make his point, he nicely summarizes organizational schemes of the past including the alphabet, good old Mevil Dewey, Linnaeus, Ranganathan (woo! ), the card catalog, Encyclopaedia Britannica, and many more. His overviews are fun to read, well-researched, and deep enough to make his point without getting sidetracked. He then contrasts these traditional methods of organization with the Web 2.0 variety, leaning heavily on Flickr and Wikipedia as examples of tagging and social creation of content. In the end, he points us in the direction of a world filled with user-generated content and context where the interconnections are as important as the information itself, and where creativity and knowledge are found in the spaces between my ideas and your ideas. This is all pretty heady stuff, but Weinberger is a very readable philosopher who gives his readers plenty of concrete examples to latch onto. Occasionally I found myself getting a little huffy (why, oh why, does he constantly use the card catalog as his illustration of how libraries organize things and never mention the OPAC? Why no mention of brick and mortor libraries that are incorporating Web 2.0 into their cataloging and public access? Why are libraries implicitly lumped in with "the man" who is keeping information out of the hands of the masses? How would he handle providing access to collections that are both physical and digital?). But once I calmed down a little, most of my qualms ended up being addressed elsewhere in the book, or could easily be dismissed by the fact that Weinberger isn't writing a book about libraries or archives, there is just a lot of overlap in what we are trying to accomplish. This is a great book to read if you are a librarian, a library-wanna-be, an archivist, a techie, a scholar, a Flickr user, a philosopher, or just some jerk who likes to find things on the Internet. Has anyone seen my bookmark?